Detective Mercedes Knight (“Misty”) was a promising police officer with the New York Police Department who was forced into permitting the amputation of her right arm after she was terribly injured while trying to prevent a bomb attack. Rather than resign to fate or take up a job behind the desk, she left the police and sought help from an old friend and a long time partner Rafael Scarfe. Tony Stark would later provide Misty with a bionic arm which gave her a supernatural strength to join in the fight against evil… I am sure many of you are familiar with the character of Detective Misty Knight played by Simone Missick on the Marvel Cinematic Universe TV Series (Luke Cage, The Defenders, and Iron Fist). While a lot is known about the character she played in the film, not many people know who Missick is in the real world, but here you will learn everything there is to know about her. Missick is a talented Hollywood actress born in Detroit, Michigan on the 19th day of January 1981 as Simone Cook. Missick is not an only child as she has two siblings – a brother and a sister. She was raised in a working-class family; her mother worked as a health inspector, before taking up another job as a social worker and her dad was an adult education teacher for over twenty years. She attended Renaissance High School, Detroit, Michigan and graduated in 1999. After high school, she proceeded to Howard University for a degree in English and graduated in 2003. Simeon has always been interested in the arts as a child so she tried her hands on almost everything arts. She sang and was over at Bates Academy where she learned to play the violin with Dave Berry. In high school, Missick played tennis, softball, basketball and ran tracks. She thought she could make a career in music so during her junior years of high school, she was a member of the Blue Lake International Orchestra. Missick traveled abroad with them for performances but soon found out that her passion wasn’t in music but in something else which was acting thus, she finally decided to go with acting. So while she majored in English at Howard, the young woman took a minor in theatre which gave her a footing in acting. Thus, in addition to her English major degree, the superhero actress also graduated with a minor in Theatre Arts. After graduating from Howard, Simone Missick determined to improve her acting skills headed to Oxford England to take part in the British American Drama Academy Master Classes with Jane Lapotaire, Ben Kingsley and Alan Rickman. After the classes, she performed briefly in the regional theatre in Detroit before relocating to L.A. In 2012, she played Elise in Hallmark Channel original movie A Taste of Romance and in 2014, she starred as Porschla in TV crime drama Ray Donovan while in 2015, she landed the role as Misty Knight one of Marvel Cinematic Universe Series Luke Cage. On how she landed the role, Simone Missick told Hour Detriot she auditioned in her living room, put it in a tape and sent it to her manager who submitted it. She was later invited for a live audition where she performed before the showrunner, head writer, executive producer and all. According to her, they all kept a poker face during the audition but would later tell her after she got the job that they knew she was Misty the moment she walked into the audition room but wanted to make sure, she was the real deal. She has since reprised her character in Marvel’s other series which include The Defenders and Iron Fist. In 2018, she made her first New York Theatre appearance in Paradise Blue written by Dominique Morrisseau. She is said to be currently working on an Orion pictures film, Jinn. The movie in which she both starred in and also produced is set hit the theatres in November 2018. Remember her birth name is Simone Cook? 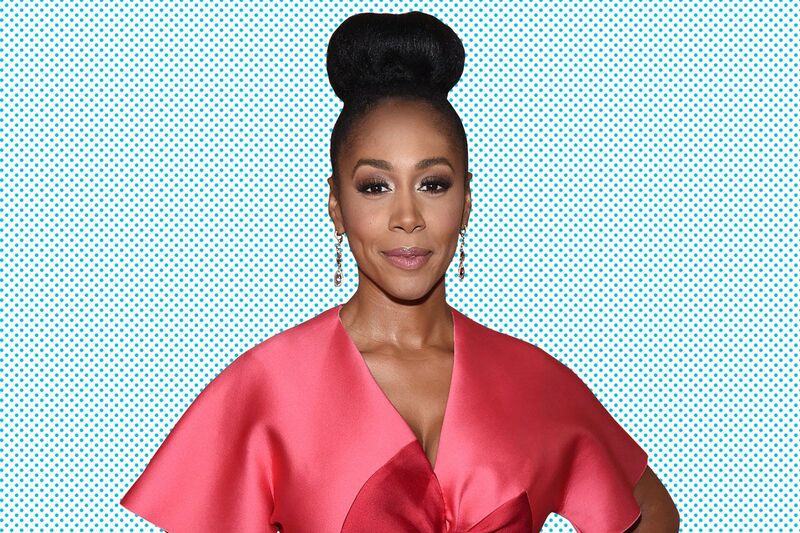 She became Simone Missick after she married Hollywood actor Dorian Missick in 2012. Dorian is an established Hollywood actor who has appeared in several movies like Lucky Number Slevin, Premium, Southland, The Manchurian Candidate. He also played Damian in the TV series Six Degrees, voiced Victor Vance in the video game Grand Theft Auto: Vice City Stories and starred alongside Simone in the second season of Luke Cage. He played Dontrell Hamilton (“Cockroach”), the ex-con who was put away by Misty and was later released due to her late partner Scarfe tainting his conviction. The actress stands at a height of 5 feet 6 inches or 1.68 m. At this height, she weighs about 132 lbs or 60 kg. Missick has an hourglass body shape with measurements of 37-25-36 inches (94-64-91 cm) being for bust, waist, and hips respectively. Her bra size is 34DD / 34E while she wears a dress size of 10. The actress has certainly had it good in her career all thanks to her sheer talent for which she has been well rewarded. Simone Missick has a net worth of about $1 million.